I started this one a couple weeks ago, so don't hold our breath for the second page, but I'll get to it soon and don't worry... it'll make sense... well... as much sense as my work generally does! Trust me... it'll work! Regarding the process, I did a pretty simple drawing on a piece of lined paper (the lines are quite helpful for designing the page and panel layout), then scanned it and inked it. 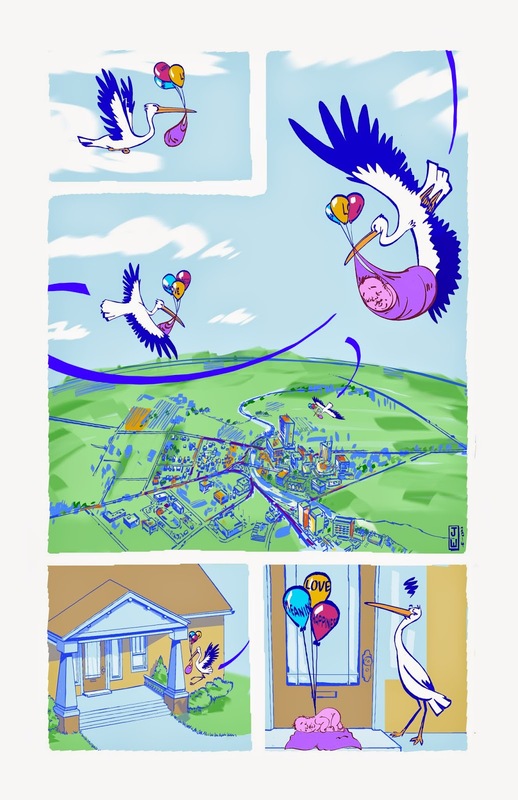 My concerns were to get the stork looking good. I looked at some photos online and could picture the poses and angles in my head, so he came together pretty easily. Also, I was worried I wouldn't be able to make the city look reasonable or interesting. Too much detail would kill me, so I decided to suggest the buildings with shadow and few simple details. I enjoyed imagining the city, the transit lines, the downtown, the industrial areas etc. Two radio-filled hours later and you can see the result. Take that, Mr. City Planner! It was then that Christine looked at it and said the baby didn't look like a baby. Or rather, she said "What's that?!" Never a good sign - the drawing should speak for itself. So, like I said, page 2 will be coming (sometime!) and when it is done, I hope you won't look at it and say "What the?!"